The signs are familiar and common yet never easy to watch: short, stubby strides, marked soreness, the head-bobbing lameness. When those kinds of symptoms are caused by navicular syndrome, treatment options have been depressingly slim. But in the early part of this century, veterinarians with well-connected European colleagues heard whisperings about, or actually obtained, a new drug that appeared to work wonders at restoring soundness in horses with bone-related lamenesses. From grand prix jumpers with slight changes in their legs to backyard pleasure horses stricken by navicular, a drug called Tildren appeared to slow the bone deconstruction process. Today, Tildren has become a one-dose ticket to recovery or prevention for many horses. The problem? In the six years since people started hearing about the medicine, the U.S. Federal Drug Administration has yet to approve Tildren for use in this country. That may change soon, however, if the results of an intense, nationwide study currently underway and being funded by the drug’s founder, Ceva Sante Animale in France, go according to expectations. FDA approval of the drug would open up access to Tildren for veterinarians and likely decrease the price of the medicine, making the drug available to a greater number of horses and owners. Perhaps because of its international origins, Tildren still isn’t well known. In France, Ceva is a leading science and research company that has introduced new drugs and therapies for everything from cows and poultry to dogs and swine and horses. But to obtain Ceva’s Tildren in the United States, licensed veterinarians are required by law to fill out separate applications for each horse they think qualifies for the medicine, a process that can take six to eight weeks from the time a veterinarian diagnoses a horse’s condition to when he or she has Tildren ready to administer. Upon arrival, the drug maintains its mystique. At Homestead Equine Hospital in Pacific, Mo., veterinarian Mark Cassells remembered being a bit perplexed when he ordered Tildren for the first time. The package was a little blue box that, when unwrapped, revealed rows of little bottles and vials and a bunch of French or German directions on how to administer it. Most veterinarians prefer the one-time intravenous dose. Instead of oral medicine, which gets absorbed more slowly or not at all because it goes through the digestion system, intravenous Tildren soaks into a horse’s bones like water seeping into a sponge. This is where Tildren goes to work. In a horse with navicular or any other chronic bone condition—ringbone, for instance, or osteoarthritis of the hock—Tildren inhibits bone deconstruction by shutting down what are known as osteoclasts. Osteoclasts, like hungry termites, digest bone, and Tildren impedes their progress. More scientifically, Tildren is a class of substances known as bisphosphonates, which inhibit osteoclast action and the resorption of bone. In healthy horses, bone is constantly being remodeled. This is how animals get stronger; when the skeletal structure is stressed through training, it responds by making new bone tissue. Osteoclasts in a healthy horse eat away old bone to make room for the new and denser bone, which is formed with the help of osteoblasts. But typically, osteoblasts work much more slowly than the nibbling osteoclasts. This is especially important in horses with navicular syndrome and other chronic bone conditions, where the bone breakdown process may exceed the bone rebuilding process, explained veterinarian Rick Mitchell, of Fairfield Equine Associates in Newtown, Conn.
Tildren already exists in an oral form that is approved for human use. Known generically as “tiludronate” or “tiludronate disodium,” the substance is typically obtained under the brand name Skelid, and it’s used to slow the weakening of bone that occurs in a condition called Paget’s disease. Currently, it’s also being tested for treating osteoporosis. As for horses, the best ammunition veterinarians and owners had against chronic bone conditions before Tildren weren’t substances that directly targeted the bone at all. Drugs such as isoxsuprine and pentoxifiline are thought to primarily increase circulation in the afflicted areas, though as Mitchell noted, nobody has rigorously proved isoxsuprine’s efficacy in randomized and controlled studies. Tildren hasn’t replaced those drugs, but it has offered a significantly different way of attacking the root problem of many chronic bone conditions: bone breakdown. In one small study Mitchell and his colleagues conducted several years ago, the administration of Tildren, combined with corrective shoeing in horses that showed signs of navicular, had about an 80 percent soundness success rate after six months. The study was fairly small, but Mitchell and other researchers were careful to make sure the cause of lameness was navicular and not some other factor. In every case, the administration of Tildren helped more horses after six months than horses that were administered other types of therapies without Tildren, for instance, corrective shoeing with bute and banamine treatment. It’s still possible, said Mitchell, that it was simply their selection of cases that produced the positive results and not the drug itself. But, the results they got in that study matched the results obtained by Jean-Marie Denoix, a veterinarian in France, one of the earliest researchers to test the drug and one of the most well-known experts in the field. The most rigorous and widespread Tildren study to date is currently being carried out in about nine locations across the United States. Mitchell’s clinic is one of the test sites, as is the Wisconsin Equine Clinic and Hospital in Oconomowoc, about 35 minutes west of Milwaukee. Ceva is paying for the study, with the explicit goal of proving efficacy and getting an FDA permit to treat navicular bone disease with the drug. At Wisconsin Equine, veterinarian Doug Langer has so far had 23 horses that have been accepted into the study. He expected the 200 horses needed across the country to be accepted before the end of 2008. The only problem, he said, is that only a small percentage of horses they test actually qualify to be a part of the study—between 20 and 25 percent. With more thorough imaging, Langer said they sometimes discover that potential test subjects have more going on inside their bodies than just changes to the navicular bone. For control purposes, the horses accepted must only show changes to their navicular bone and no other ligament, tendon or bone injuries. “I don’t think the company paying for the study expected they would have to be paying for so many MRIs,” Langer said. Once the test subjects are identified, the horses either receive Tildren or an intravenous placebo. The veterinarians then follow the test subjects for two months and document any changes. If, at the end of the two months, it turns out that the horse received the placebo, then the owner is allowed to have their horse receive the real drug, if they so choose. On the East Coast, Mitchell said that getting horses into the study has been a bit slow because some owners don’t want to disrupt their show schedule; others are leery of being involved in a study where for two months their horse may only be receiving a placebo. But the point of a rigorous study, Mitchell said, is to prove efficacy. Once you can prove efficacy and safety, everything else tends to fall in line and the drug will be made available in the United States. Tildren is not a cure-all, and there are still some drawbacks. The drug targets bone and, specifically, the processes that affect bone degeneration. So that means it won’t ease any lamenesses caused by tendon, ligament or muscle injuries. Also, it’s not intended for use on horses that are still growing, or mares that are pregnant or lactating. Occasionally, some horses get a bit colicky after the administration of the IV fluid with the Tildren solution. Also, Tildren cannot be used while a horse is in competition as there are some withdrawal times. Then there’s the issue of price. 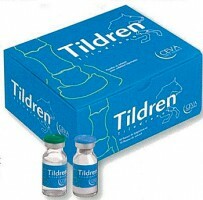 At $1,000 to $1,100 per dose (one time or 10 intravenous shots over 10 days), Tildren isn’t a cheap medication. However, that price is likely to decrease once the FDA approves the drug and it becomes warehoused in the United States. To keep extra doses of Tildren on hand right now, many veterinarians are compelled to engage in a bit of sleight of hand with the FDA, usually by re-submitting the names of horses who have already received the drug to keep new doses coming over from Europe. This keeps the veterinarians from having to go through the laborious process of filling out all new paperwork for a new horse that needs the drug and making the owner wait six weeks or so until the medicine comes through in that horse’s name. Some veterinarians combine Tildren with additional therapies such as shockwave therapy to get the best results. Kathy Frame, from Oconomowoc, Wisc., said that her 16-year-old grand prix show jumper had a bit of a hitch in his hind end, which she treated with Tildren and then shockwave therapy. Frame said the horse was never lame, he just seemed a bit off. “We won a grand prix the week I did the shockwave, so it’s a little hard to tell if it was the Tildren I did before or the other therapy,” Frame said. Kyle Dewar, also from Oconomowoc (and engaged to Frame), said he once used Tildren on one of his older horses. The horse had ringbone, Dewer said, and he administered Tildren after getting the drug from a friend in Europe. “It eased his arthritic changes,” Dewer said of his older jumper. Now, Dewar said, he uses it on some warmbloods that he imports from Europe. As a rule, people won’t see immediate effects from Tildren. It takes time to work, and the maximum benefit will be seen in about two months.